Recently, the Committee of Chief Ministers on Digital Payments has recommended the restoration of Banking Cash Transaction Tax(BCTT). It was recommended by the Committee in order to promote digital payments in the country. This committee was headed by Andhra Pradesh Chief Minister Chandrababu Naidu. 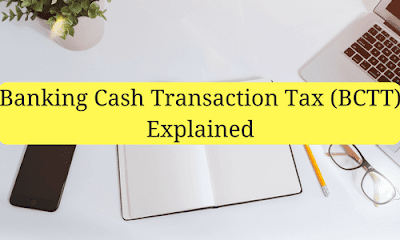 What is Banking Cash Transaction Tax (BCTT)? It is a type of Direct Tax which was levied(from 2005 to 2009) on cash transactions exceeding a specific amount from the bank by a customer. Currently, Government is examining the recommendations of the high-powered Committee of Chief Minister on Digital Payments. According to which, Banking Cash Transaction Tax(BCTT) should be levied on cash deals of Rs. 50,000 and above. Earlier, it was first introduced in 2005 by the UPA-1 government under the Finance Act, 2005. But after four years it was rolled back on 1 April 2009. During this period it was 0.1%. Also, it was not applicable in the state of Jammu and Kashmir. Again, Tax Administration Committee headed by Parthasarathi Shome had also recommended reinstating the BCTT in 2014. It will be a positive step against Black Money, as all currency denominations above a certain amount would be scrapped and it would force Black Money hoarders to switch to electronic methods of transaction. And with electronic transactions, a tax would be deducted straightway with every transaction at a nominal rate. It will drastically reduce the scope of hoarding cash wealth and evade taxes using the loopholes of Tax Laws. It will bring a large number of people under the taxation ambit. BCTT will help in achieving governments of making India a Cashless Economy. These are taxes which are directly paid to the government by the taxpayer. This tax is directly levied by the government on individuals and organisations. For Example, Income Tax, Wealth Tax, Corporation Tax, Banking Cash Transaction Tax(BCTT), etc. These taxes are levied on the manufacture or sale of goods and services. Indirect taxes are not directly paid to the government, instead, they are initially paid to an intermediary which transfer these taxes to the customer. For Example, sales tax, service tax, excise duty etc.